Issue #2: My pump has low suction! There are several possible causes for low breastpump suction. First, please check your pieces. The valves and membranes should be free from defects. Make sure the white membranes lay flat against the yellow valve and don’t have any tears. Your tubing should be purchased from a Medela-authorized retailer. It is common for generic tubing to not work well. If your tubing appears to have any crimps, punctures, or mold growth, please purchase another set of tubing. The flanges (the pieces that come in contact with your breasts) should fit properly. Not every woman will need the 24mm flanges that are included with the kit. Aside from some discomfort, your pump may appear to have suction issues if you are using the wrong flange size. You can view Medela’s sizing guide here to determine if you need a different size. If you are still unable to determine your best size, please contact us to set up a time to visit us in our office for a professional fitting. If you think only one side of your breastpump is having suction issues, you can do a quick test to determine the cause. Open the lid and switch out the parts from one side to the other, caps and all. If the side with the suction issues is suddenly better and the other side is worse, you should inspect your parts for defects; there is likely nothing wrong with your breastpump. If you’re still experiencing low suction on the side you initially thought was the problem, contact us to arrange an exchange. Issue #3: My pump displays an error message, chirps, then shuts down! Sometimes unavoidable problems occur with the pumps as they age. If your pump is displaying an error message, you can reset the pump to get you through the next couple of pumping sessions, but you should make arrangements to exchange the pump as soon as possible. Press the let-down button and hold. While holding the let-down button, press the on/off button. 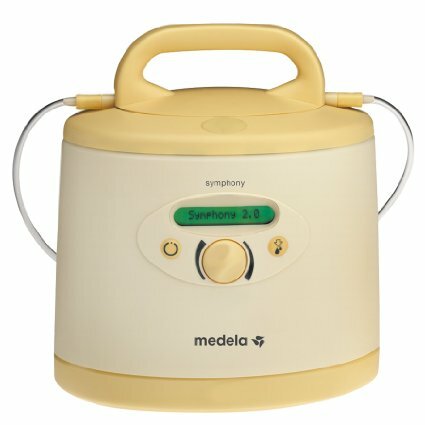 Keep in mind, it is normal for your Symphony breastpump to shut off automatically after 30 minutes. Issue #4: My battery-operated Symphony breastpump keeps saying “battery flat” or “battery low” even though it just finished charging! Just like a laptop, sometimes the internal batteries in the Symphony Plus model need to be replaced. If your pump has charged for the recommended amount of time (12 hours) and will not remain on for at least two full 30-minute pumping sessions throughout the day, please make arrangments to exchange it as soon as possible. The pump will continue to work while plugged in, but you shouldn’t depend on a spent battery for continued cordless operation. Charge the pump for a full 12 hours upon receipt. Do not fully drain the battery on a regular basis. Allow the pump to charge when not in use. Charge the pump for 12 hours each night at a minimum. Pumps will still work while they are plugged in. Issue #5: My breastpump is making strange noises, movements, or noticeably fluctuates in suction while pumping. Some noises and lid movements are normal, especially if you’re using higher suction settings. Unless you notice a decrease in performance, it is not always necessary to contact us about these issues. However, if the suction on your breastpump fluctuates without any user input or if you become concerned with noises/lid movements, please do not hesitate to contact us for an exchange. We want you to be completely satisfied with the services you receive from us! If you are having any other problems with your pump that haven’t been disscussed in this article and would like to discuss a solution, please don’t hesitate to contact us. We have the equipment necessary to test a variety of Medela breastpumps including the Pump in Style, Freestyle, and Swing, and we’ll happily do this free of charge! Shared with permission from http://www.metropolitanbreastfeeding.com/help-my-pump-wont-work/.